Officially licensed LSU Tigers NCAA 3" x 12" decal strip. Decal strips can be placed on a variety of surfaces, not just a bumper, with their self-adhesive back. Made in USA. 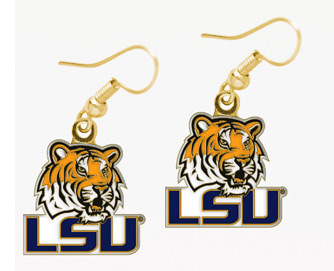 Officially licensed LSU Tigers felt NCAA pennant. Made in USA. Pennant measures 12" x 30"
Officially licensed LSU Tigers NCAA mouse pad. This mouse pad features a soft fabric surface with thick neoprene backing. Mousepad measures 9" x 8"
Officially licensed NCAA gold wire earrings with Louisiana State University LSU Tigers team logo in hard enamel modern cloisonne. LSU Tigers - NCAA Car Flag. 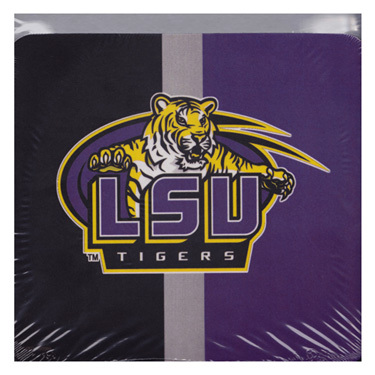 Officially licensed Louisiana State University Tigers two-sided NCAA car flag, with wall mount. Car flag measures 11" x 18"